Sixteen companies received private funding rounds of $100 million or more during the month of January, with two privately held companies, Infor and Verily Life Sciences, taking in rounds of $1.5 billion and $1 billion, respectively. The market segments represented in the January rounds were varied. Multiple companies using artificial intelligence technology in their offerings and cloud-based businesses were common themes for the first month of 2019. Private equity firms predominated in the larger rounds of the month, putting hundreds of millions of dollars into a select few ventures. As impressive as the publicly announced funding rounds were in January, even more dizzying figures are rumored to be in the works for several companies. SenseTime Group, China’s highly valued AI startup, was reportedly pulling together a fresh round of about $2 billion, Bloomberg reports, citing people with knowledge of the matter. The Beijing-based firm last year raised $1.22 billion from Alibaba Group and other investors that included Fidelity International, Hopu Group, Qualcomm, Silver Lake Partners, and Tiger Global. Indonesia’s Go-Jek is rounding up investors to put $2 billion into the company, which would value the ride-sharing startup at $9.5 billion. TechCrunch reports that Google, JD.com, Tencent, and other investors have committed $920 million toward that $2 billion goal. The Information reports that Katerra, the construction-tech startup led by former Flex CEO Michael Marks, is raising $700 million in new funding to be led by the SoftBank Vision Fund. Horizon Robotics, a China-based AI chip designer, is supposedly closing in on $600 million in Series B funding. During CES 2019, CEO Yu Kai said investors in the latest round come from the automotive and semiconductor industries. Intel Capital is a past investor in the startup, established in 2015, as is Sequoia Capital China. Recode reports that Aurora is on the cusp of a $500 million round, maybe higher, led by Sequoia Capital. The automated driving system startup was founded in 2016 by CEO Chris Urmson (formerly of Google/Waymo) and Sterling Anderson (formerly of Tesla). Aurora received $90 million in Series A funding less than one year ago. Bird and Lime, leaders in the electric scooter market, are both scouring the streets for new funding. Bird is reportedly raising $300 million in a round led by Fidelity, Axios reports, while Lime is said to be seeking around $400 million. Bain Capital Ventures was allegedly set to lead the Lime round, although it has since lowered its profile to that of a new investor. Silver Lake Partners led the $1 billion funding round for Verily Life Sciences, formerly Google Life Sciences. Also investing in the Alphabet health-care subsidiary was Ontario Teachers’ Pension Plan, among others. Goldman Sachs provided financial advice to Verily, related to the funding. Verily will expand its Partner Space collaboration and investment program with startups, using some of the new funding. Culture Robotics and Freenome are involved in the Partner Space program. Mobility, an attractive market these days, presented a wide field for investments. ClearMotion of Boston is involved in digital chassis technology, looking to provide smooth rides in assisted and automated driving. The startup, founded in 2009, raised $115 million in Series D funding led by Franklin Templeton. Microsoft, Bridgestone, Qualcomm, World Innovation Lab, NewView Capital, Eileses Capital, and clients advised by J.P. Morgan Asset Management also participated. ClearMotion acquired Bose Ride in November 2017, which has patented technology to reduce the jolts resulting from potholes and other bumps in the pavement. India’s CarDekho, an online automobile sales marketplace, received $110 million in Series C funding from Hillhouse Capital, Sequoia India, and CapitalG, all existing investors. The startup also provides financial services and insurance coverage. Axis Bank, a financing partner, also invested in CarDekho. NEXT Trucking of Gardena, Calif., raised $97 million in Series C funding led by Brookfield Ventures. Sequoia Capital, GLP, and others invested in the logistics platform provider. NEXT has raised a total of $125 million in private funding. Berlin-based Flash, an e-scooter startup, came out of stealth mode with €55 million (about $62.85 million) in Series A funding led by Target Global. Idinvest Partners, Signals Venture Capital, and angel investors also participated in the funding round. Flash is currently launching its e-scooters in Portugal and Switzerland; springtime will see launches in France, Italy, and Spain; the rest of Europe will get the Flash scooters during the summer of 2019. Chicago-based Clearcover, an auto insurance startup, received $43 million in Series B equity funding and debt funding. Cox Enterprises led the equity funding. American Family Ventures, IA Capital Group, Lightbank, and Hyde Park Angels also participated in the round. Silicon Valley Bank provided debt financing. Wheels Labs of West Hollywood, Calif., an electric bicycle-sharing venture, raised $37 million from Tenaya Capital, Bullpen Capital, Crosscut Capital, 3L Capital, Naval Ravikant, and other investors. Brothers Jonathan Viner (president) and Joshua Viner (CEO) previously were co-founders of Wag, a dog-walking startup. Dallas-based Alto Experience, which provides a ride-hailing service with a fleet of luxury SUVs, received two rounds of funding totaling $14.5 million from private investors that included Road Ventures and Frog Ventures. While the company has a mobile application to summon a ride, its service is open to members only. Its employee drivers (not contractors) are said to be vetted, trained, and managed by their individual performance. Foretellix of Tel Aviv, Israel, raised $14 million of Series A funding led by 83North Venture Capital, Jump Capital, and NextGear Ventures, bringing its total private funding to more than $16 million. The startup automates the verification and measurable safety of autonomous vehicles. Truebil of Mumbai, India, received $14 million in Series B funding and debt financing. Joe Hirao, a Japanese investor, led the funding round, which also saw participation by Kallaari Capital, Inventus Capital, Kae, Shunwei Capital, and Tekton. Merisis Advisors acted as the investment banker. Truebil operates an e-commerce platform for buying and selling used cars. Its total funding now is $22.4 million. Driivz of Hod Hasharin, Israel, raised $12 million from Invent Capital, CEZ Group’s investment fund, Centrica plc, and Ombu Group. The startup is developing a smart electric vehicle charging management platform. Tsahi Merkur is the company’s founder and seed investor. Paris-based Zoov, an electric bike-sharing service, received $6.8 million in venture capital from Daphni, C4 Ventures, Road Ventures, BNP Paribas Developpement, and the Banque des Territoires. Eric Carreel, the co-founder of Withings, is a co-founder of this startup and serves as its chairman. BP Ventures invested in PowerShare, a startup that links electric vehicle drivers to charging stations and helps to balance power distribution. The Chinese company also offers an app for mobile devices. The size of the investment wasn’t revealed, although BP Ventures typically invests up to $10 million in a startup. Amazon is investing in Balyo, a French developer of warehouse robotics, which offers technology to turn forklifts into self-driving trucks. Amazon could own 29% of Balyo if it places orders of up to €300 million (about $342.8 million) with the French company over seven years. Cybersecurity is another popular area for investors, and January was no different than previous months. OneLogIn of San Francisco, which provides cloud-based identity and access management, raised $100 million in Series D funding led by Greenspring Associations. Charles River Ventures and Scale Venture Partners, existing investors, participated in the new round. The company has more than 2,500 enterprises as clients, including Airbus, Bay Area Rapid Transit, Fujitsu, Indeed.com, NASA, and Pandora. Cleveland-based Keyfactor, an information security provider formerly known as Certified Security Solutions, received $77 million in new funding from Insight Venture Partners. CSS was founded in 2001 and rebranded in November. Plymouth Growth Partners and Generation Ventures invested $3.5 million in CSS last September. Crunchbase reports the company has a total of $86.9 million in private funding over five rounds, dating back to an angel round in 2009. Sonrai Security raised C$24.5 million (about $18.5 million) in Series A funding led by Polaris Partners and TenEleven Ventures. The New Brunswick Innovation Foundation also participated. Sonrai provides cloud data control and compliance services. The two-year-old startup has offices in New Brunswick, New York, and Texas. Immersive Labs of the U.K. received $8 million in Series A funding from Goldman Sachs and other investors. The startup offers a cybersecurity skills platform, and it was founded by James Hadley, a former researcher at Government Communications Headquarters (GCHQ), the U.K.’s signals intelligence and information assurance agency. Syncurity of Bethesda, Md., raised $2 million in private funding. The Maryland Technology Development Corp. originally led the funding round before it closed oversubscribed with the addition of Kluz Ventures through The Next Impact fund. SixThirty CYBER also participated in the round. Syncurity specializes in security orchestration, automation, and response software. Chip and sensor companies also were funded in January. Samsara Networks received $100 million in Series E funding to continue development of its sensor data platform. The new round was led by Andreessen Horowitz and General Catalyst. The startup, founded in 2015, is now valued at $3.6 billion. Its total private funding is $230 million, according to PitchBook and Crunchbase. Wiliot, an Israeli startup developing passive system-on-a-chip devices for the Internet of Things, raised $30 million in Series B funding from Amazon, Samsung Electronics, and Avery Dennison. Norwest Venture Partners, 83North Venture Capital, Grove Venture Partners, Qualcomm Ventures, and M Ventures, all existing investors, also participated in the new round. The fabless semiconductor company has offices in Israel and San Diego, Calif. Wiliot’s total funding is said to be $35 million to $50 million. Hailo, another Israeli startup, added $9 million to its Series A funding round, bringing the total to $21.5 million. The company is developing a deep learning processor. Its investors include Glory Ventures, OurCrowd, Maniv Mobility, NextGear Ventures, and angel investors. Iris Capital led $10 million in strategic funding for Celeno of Ra’anana, Israel, a developer of Wi-Fi chipsets. Celeno was founded in 2005. Its existing backers, which took part in the new funding, include 83North Venture Capital, Cisco Systems, Liberty Global, Miven Venture Partners, OurCrowd, Pitango Venture Capital, Poalim Capital Markets, Red Dot Capital Partners, and Vintage Investment Partners. The company will debut a Wi-Fi 6 chipset this year. 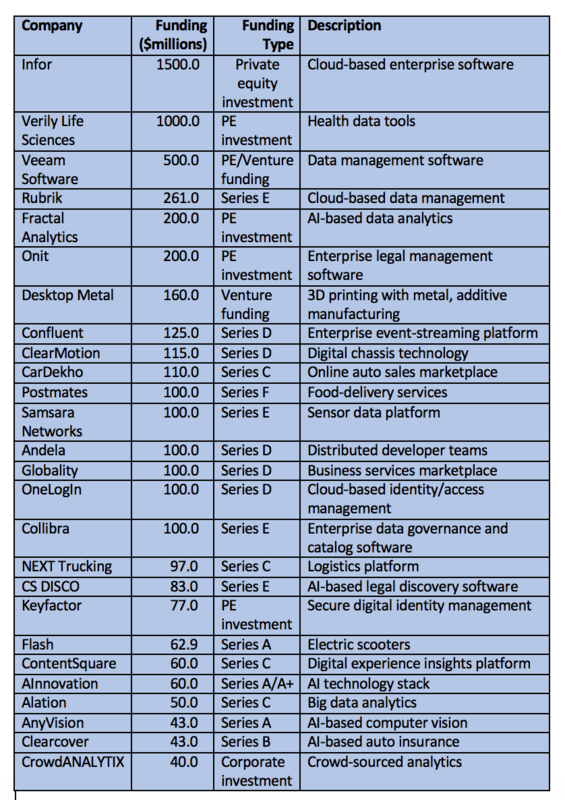 Data management was one of the fields that saw funding rounds in January. Veeam Software of Baar, Switzerland, specializes in cloud-based data management services. It took in $500 million from just two investors, Insight Venture Partners and the Canada Pension Plan Investment Board. The company works with Amazon Web Services, IBM Cloud, Microsoft Azure and other providers of cloud services. Gartner says Veeam is a leader in the data center backup and recovery market, competing with Commvault, Dell EMC, IBM, and Veritas Technologies. The company has 325,000 customers and about $1 billion in annual revenue. Picking up $261 million in Series E funding was Palo Alto, Calif.-based Rubrik, which offers a cloud data management platform for enterprises. Bain Capital Partners, Lightspeed Venture Partners, Greylock Partners, Khosla Ventures, and Insight Venture Partners participated in the new round, which values Rubrik at $3.3 billion. The company may go public in 2019. Got a startup working in artificial intelligence, blockchain, cybersecurity, data management, microchips, or mobility? You could likely get private funding this year!